This Red-shouldered Hawk was found in Wilmington eating something from Wawa that was spicy, toasted, and had Swiss cheese. Photo by Jill Constantine. I am a big fan of Wawa. My car tends to automatically veer towards these fine convenience stores. Free ATM, good coffee, fast service…how can you beat that? Until this week, I didn’t know hawks were also Wawa devotees. I’ve seen gulls, crows, starlings, grackles, and House Sparrows eating Wawa products, but not a hawk. That is why I was amused to see this fine portrait of a handsome Red-shouldered Hawk feasting a fast-food sandwich. It is a good reminder not to throw food out on the roadside…animals get hit by cars coming to eat refuse. Jill Constantine, a regular reader of The Nature of Delaware, has seen this bird hanging out in Brookmeade II neighborhood in Wilmington for the last few weeks. 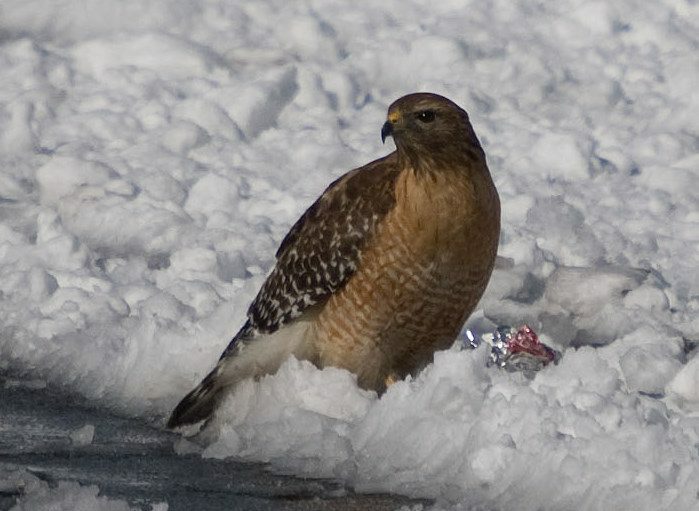 On February 22, she came across the hawk feasting on a Wawa product and was able to snap this photograph. According to Jill, the bird was reluctant to fly from its meal, which enabled her to get close. Eventually the bird took off and it took the sandwich with it. I would like to invite you, the reader, to share your wildlife photos and nature stories with us. If you photograph a rare animal, an animal doing something interesting, or something else that captures an experience with the natural world that is noteworthy, please send it our way. If you’ve witnessed something in nature and would like to share your experience but didn’t take a photo, tell us your story. We would like to publish your photos and short stories fairly regularly. The rules are that it should be from Delaware, and the photo needs to be relatively good. Email joe@delawarenaturesociety.org if you would like your photo or tale from nature published in The Nature of Delaware. 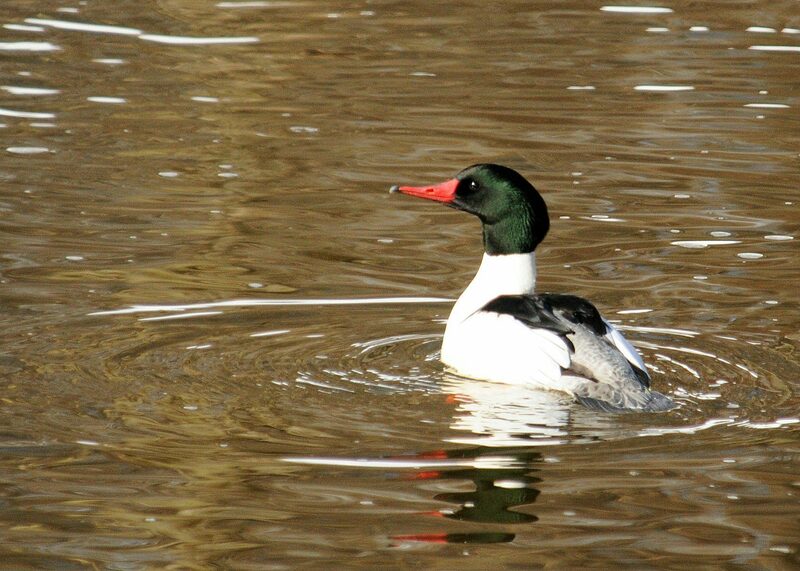 A handsome drake Common Merganser cruises down the Red Clay Creek near Ashland Nature Center. Image by Derek Stoner. The local creeks are losing their coverings of ice as winter loses its solid grip on the landscape. Wildlife quickly takes advantage of the open water and we often observe new animal activity along these waterways. 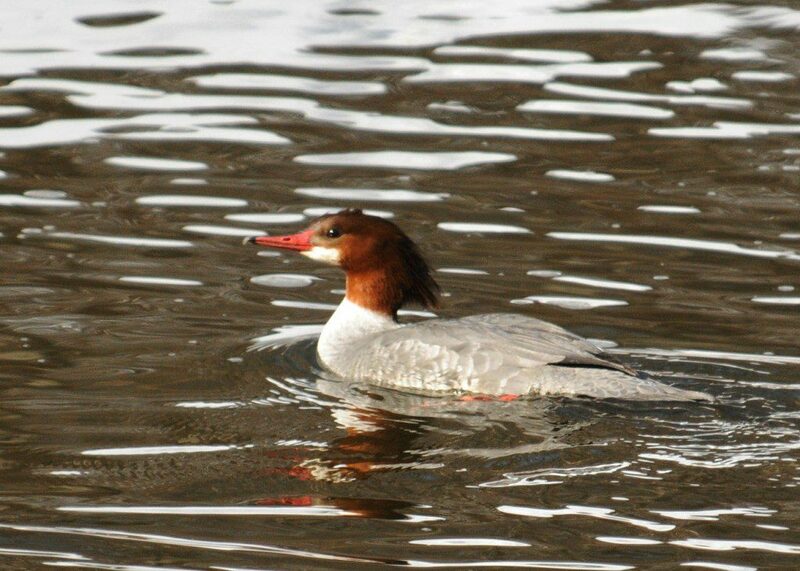 In February and March, this brings in the mergansers! I observed and photographed several groups of mergansers in the Red Clay Creek recently, along Route 82 just upstream from Ashland Nature Center. Good places to look for them are in the slow, deep stretches of water above the dams at Sharpless Road and the end of Snuff Mill Road. A hen Common Merganser shows off her shaggy orange crest. Image by Derek Stoner. Mergansers are a tribe of ducks that specialize in eating fish. The Red Clay Creek and other streams in the Piedmont region are home to a diverse array of native fish that appeal to fish-eaters like mergansers. Chubs, dace, darters, and minnows of many varieties may be found in the waters. The fast-swimming mergansers chase the fish underwater, sometimes teaming up to corral the fish and attack from different directions. The thin, serrated beak of the merganser allows it to grasp the slippery fish before it is turned and swallowed head first down the throat of the hungry duck. 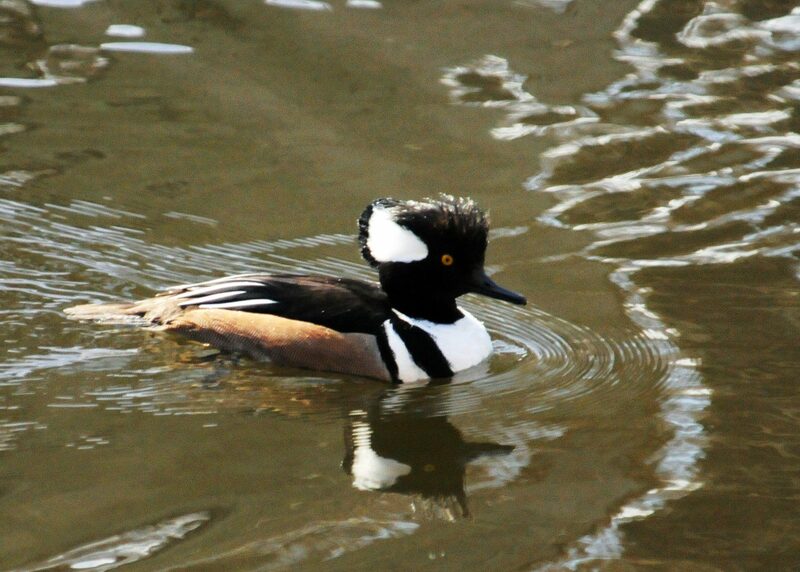 A drake Hooded Merganser displays his sleek black and white crest. Image by Derek Stoner. The drake Hooded Merganser’s piercing yellow eyes stare out from a black head accented with a large wedge of white. The chest is white with a wedge of black, making for a stark contrast of coloration. When excited and in the presence of females, the drake raises his crest fully in a wide fan shape. 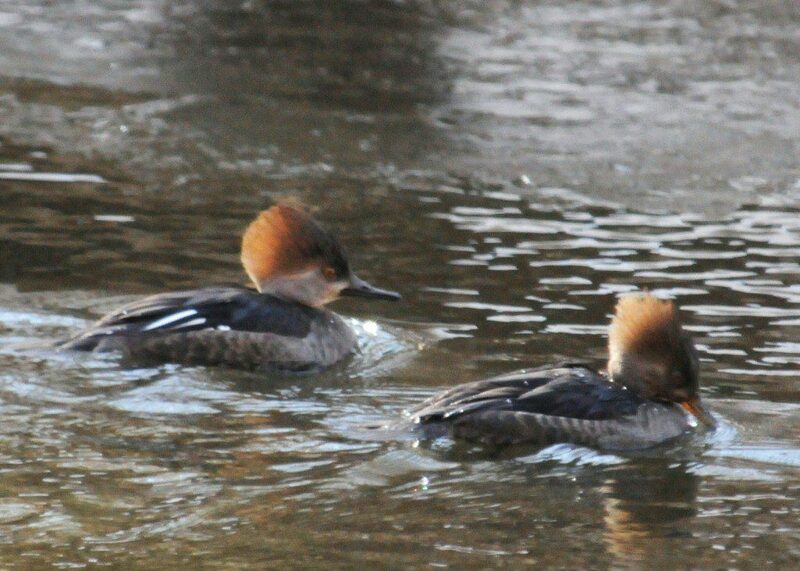 A pair of Hooded Merganser hens drift along with crests raised. Image by Derek Stoner. Hen Hooded Mergansers have a beautiful cinnamon-colored crest that when raised looks like a punk rocker’s mohawk hair. In just a couple of months, these hens will be seeking out nesting cavities (hollows in trees) where they will lay their eggs. Hooded Mergansers have been documented nesting a few times in Delaware, but generally they are a species that breeds further north in the Northeast and Canada. There is one other species of merganser that occurs in Delaware: the Red-breasted Merganser . This species occurs in winter along Delaware’s coastal areas, typically preferring salt and brackish water. If you’d like to see all three species of mergansers and at least 25 species of waterfowl in one day, join us for the Delaware Duck Day program on Sunday, March 13. We’ll travel the state in search of web-footed birds and enjoy the great diversity of ducks, geese, and swans that winter in the First State. Signs of Spring: A Contest! How soon will this scene take place in the Ashland Marsh? Warm weather(and a little rain) will coax the Wood Frogs out from their winter refuge and into the marsh for the short breeding season. Image by Derek Stoner. Who is ready to see flowers blooming? 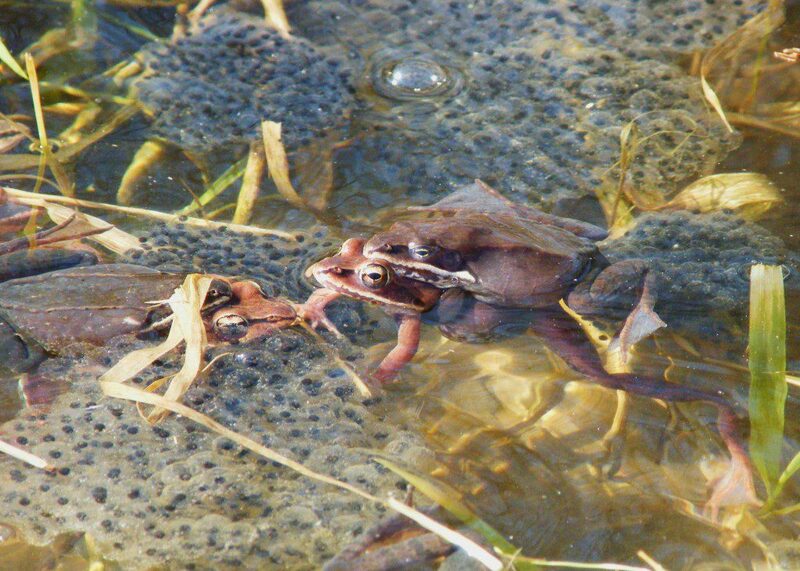 How about listening to the first Wood Frogs of the season, chuckling like ducks as they thrash about and breed in local marshes? Are you ready to shake off the heavy cloak of Winter and welcome Spring? Through all the temperature swings that nature throws out during the coming months, there is one constant: length of daylight is increasing. Every day there is a bit more sunlight reaching this region of earth, triggering the biological cues in both plants and animals to grow, to procreate, and to spring forth with life. This process is known as photoperiodism , and is the trigger that sets forth the series of dramatic changes in plants and animals each spring. 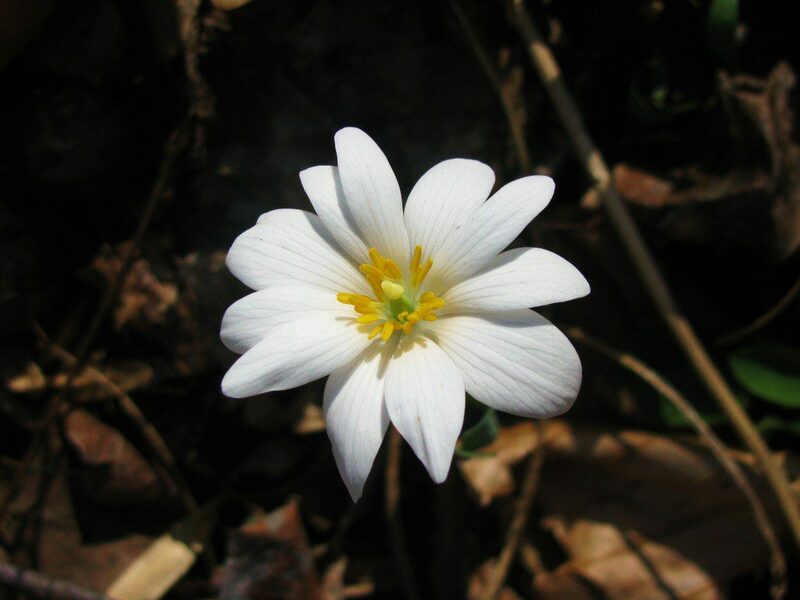 Bloodroot is a beautiful early-blooming wildflower: a true Sign of Spring. Image by Derek Stoner. March 20 is the official day that Spring begins according to the calendar. But nature does not read the calendar, and many signs of spring appear well-before March 20. 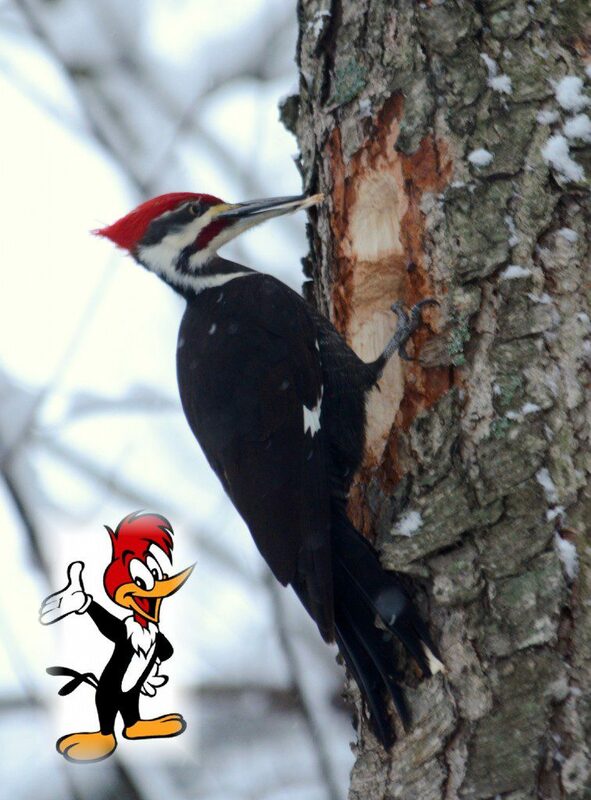 Groundhogs are stirring in their burrows, sap is flowing in the trees, and birds are beginning their spring migrations. 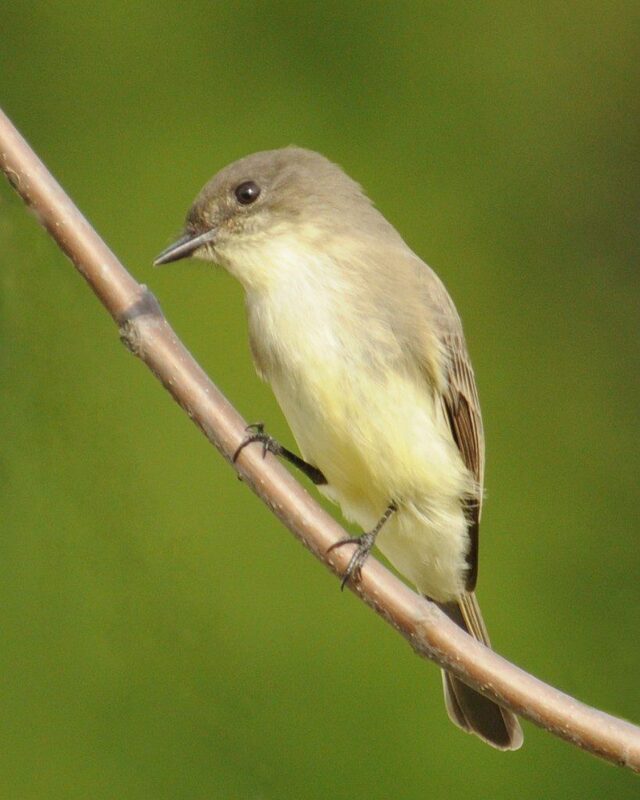 The Eastern Phoebe: how soon until this little flycatcher brightens the landscape with its cheery call? And how soon until we see a green background like that in this photo? Image by Derek Stoner. The contest concept is simple. For the next 10 weeks (February 21 through May 1), the selected 20 Signs of Spring will likely be observed at Ashland Nature Center. You pick the week you think they will occur. If you guess the correct week, you are awarded 5 points. If you guess all 20 correctly, you earn a perfect score of 100 points. If you need help identifying these selected Signs of Spring (or want to get ready for their arrival! ), check out the following video. We will provide updates on this blog as each sign makes it first-of-season appearance at Ashland. Be sure to also keep track of when you see these signs in your backyard or local natural area. Get excited about the weekly changes as the season turns! Since this is a contest, there must be a prize, right? Of course! We will offer a selection of natural history books, a gift certificate to Wild Birds Unlimited, a framed poster of all twenty “Signs of Spring,” and best of all, bragging rights as the Winner of the First Annual Signs of Spring Contest! Just fill out the contest sheet and send it in by February 20th! For questions about the contest(and hints about the timing of these signs) , please email Derek Stoner at derek@delawarenaturesociety.org or call 302-239-2334, ext 106.